04/30/2016 - GymStars is Hiring! Each time you tell someone about GymStars and they enroll in one of our many programs, you will receive a $15 reward! There is no limit to the rewards you can receive. Just ask your friend to write your name in the “How did you hear about us?” box on the registration form. Just like that, you get the $15 reward put on your account! The reward is good toward your next month’s tuition. To be eligible, the family you referred must be new to GymStars and your child must by currently enrolled. Must be a member in good standing to receive the referral reward. 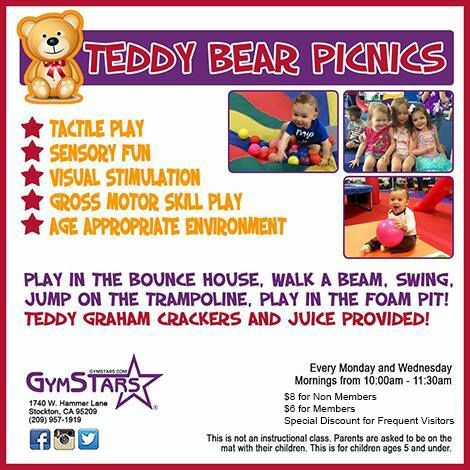 09/08/2017 - Teddy Bear Picnic for Babies and Toddlers! A perfect play date for toddlers and caregivers! Mondays and Wednesdays we invite you to come hang out on the BIG MAT with your LITTLE KIDDOS and have fun watching them explore movement, coordination, social skills, tactile play, and socialization! Your kiddos will make friends, and so will you! Call a bestie and make it a play date! Bonus, we set the times for Teddy Bear Picnic to coordinate well with an afternoon nap! According to studies, a good pattern for the little tykes is "eat, play, sleep... repeat!". Members and non-Members can register online via website or by using our Mobile App. 09/09/2016 - Safety and Security at GymStars! We take safety and security very seriously. Every year about this time we reach out to our clients and remind them of certain safety and security protocols that help keep our students, clients and staff safe and steps that can help avoid loss of personal property. If you drop your child off at the gym, please park your car and walk your child in for class. Please also ask your child to wait inside until you are back to pick them up. If you are delayed please call us. Please always lock your doors and do not leave purses, back packs, diaper bag, other bags or any items in your vehicles. Place said items in the trunk prior to reaching the gym as criminals who are out there watching will know that there may be valuables left behind. Once inside the gym we have security cameras throughout the facility recording as well as our staff is trained to look out for unwanted guest. Our emergency exists are alarmed to notify us at the front desk when the doors have been opened. At this time we check each door to make sure they are secure. At the Stockton facility we provided outside security to help deter criminal activity. If at any time you observe a suspicious person please bring it to our attention immediately or call 911. If you need assistance of any kind please ask at the front desk and we will be happy to help in any way we can. 09/08/2017 - Manage Your Account Online! • Navigate to www.gymstars.com and click on the “Manage my stockton account” link located on the front page just below our phone and address. • You will be directed to a new window with our GymStars logo to the left and a boxed login area to the right. In the boxed area, enter the email address that you have on file with us at the studio and click on “I don’t have or know my password.” A password will be randomly created and sent to you immediately by email. • Retrieve your temporary password from your email, then return to the login screen and log in to your secure personal account page. • Change your password to something you will remember under the My Account tab. Be sure to click on the SAVE button whenever you’ve made changes. • Be sure to log off after you’ve completed your session by clicking on the Sign Out link in the upper left corner of the main page. IMPORTANT NOTES & TROUBLESHOOTING: If you click on the “I don’t have or know my password” link and do not receive an automatically generated password in your email inbox, it is likely that the email address you’ve provided is not the one we have on file. Please contact us, so we can correct the email account associated with your account. You may access your secure account via the Customer Portal link "Manage My Stockton Account" found on the front page of our website at any time. Check the NEWS tab regularly for important news and upcoming events.